Great build quality, easy to operate, very powerful, and looks amazing. None to speak of - it's a great combi microwave. 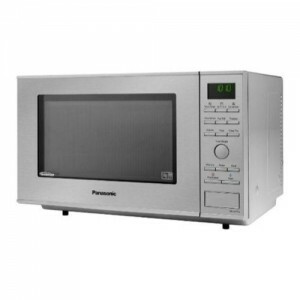 The Panasonic NN-CF771SBPQ is a stainless steel silver coloured high end combi microwave, with a spacious interior and a considerable power output. 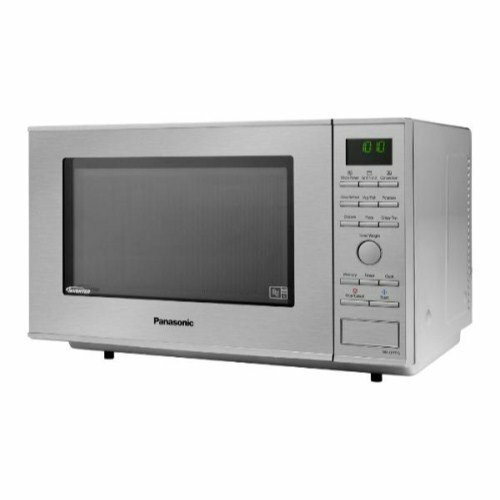 As it doesn't feature a turntable, this flatbed combi microwave from Panasonic leaves an increased amount of usable space for dishes - with the added result that larger square dishes can also fit inside with worrying whether they'd be able to rotate or not. In terms of build quality, the NN-CF771SBPQ is excellent - with a solid construction and an incredible simple control panel. Our testers loved the look and feel of this combi microwave; it will suit the vast majority of kitchens, and it feels like it is built to last. The controls are very well labelled, and so it was not really necessary to consult the booklet - and the large interior drew univeral praise. 16 auto prgrams are featured, to take the hard work out of calculating cook times for popular food types, and the powerful grill has an output of 1300w. The convection oven has a temperature range of 100-250°C and cooked beautifully - our testers were very impressed. Essentially the Panasonic NN-CF771SBPQ is an incredibly solid and functional large combi microwave oven - if you can afford to buy one, then you simply won't regret it. An incredible piece of kit - very well constructed, easy to use and extremely versatile. If you need a solid combi microwave oven, with a spacious interior and a high power output, then the Panasonic NN-CF771SBPQ will be the perfect purchase. The NN-CF771SBPQ offers a 1000W (IEC) Output when in microwave mode.